Whether you’re moving to the next suburb, interstate or overseas, it is important to know how to pack for the next chapter of your life. This checklist will help give you practical ideas and tips for moving houses, so your personal belongings arrive intact and are ready to be used (and loved) again. 1. Get started now. Don’t procrastinate; packing early will save you from a whole lot of stress down the line. 2. Organise pest control. Make sure your new house has been sprayed down before you move in so you don’t have to experience the hassle of doing it with all your furniture inside. 3. Decide on your packing needs. 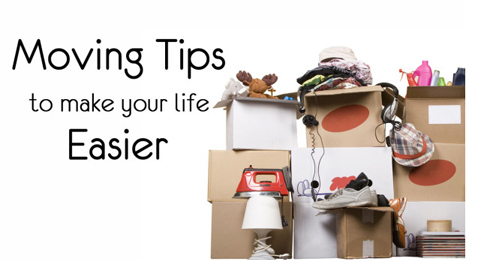 Choose which items you will pack and transport yourself versus what you will leave for your professional removalists. 4. Book your removalist. Professional removalists are normally booked out weeks in advance, so remember to book early, otherwise you may miss out on a date you wanted. 5. Source packing supplies. You should choose high quality moving boxes, bubble wrap, zip-lock bags and sticky tape to secure your items. In addition, ensure you have sharpies and coloured paper to label boxes. 6. Label and colour code everything. Create a labelling system using a colour code to designate which room each box belongs to and what content is inside. In addition, this will guide the removalists in placing the box in the designated room without you having to direct them, thus saving time and effort later on. 7. Prepare an inventory list. Detail how many boxes you’ve packed and what items are inside each, this reduce the chances of you losing something during this big transition. 8. Pack room by room. Start by packing items you would least use. Then keep all the packed boxes in their respective rooms until moving day so things are not mixed up. 9. Purge as you pack. Take this opportunity to sell, donate or throw out items you haven’t used in years. This will help eliminate clutter in your new home. In addition, start finishing off the food from your fridge and pantry to avoid waste. 10. Dismantle and flat pack. This will save you space so you can fit even more when transporting your goods. Remember to take a picture before dismantling so you know how each piece fits together when you want to reconstruct it in your new home. 11. Keep it light. Distribute weight in the boxes from heaviest at the bottom to lighter items on top. Also, cut handles into the side and make sure boxes are 20kg max as this will make carrying them both easier and safer. For collectively heavy items, such as books, pack them into a suitcase as rolling them around is easier than trying to carry them all at once. 12. Change your mailing address. Get this pesky chore out of the way before the move out. 13. Consider your first night. Make sure you have packed an overnight bag with linen, towels, change of clothes and toiletries for that first night when you’re probably too exhausted to unpack everything else. 14. Plan it out. Take pictures of your new home, then visualise and sketch out where you want your items to be positioned. This will be extra helpful if you are not there to place them yourself and are relying on someone else to do it for you. 15. Organise what to unpack. Give each box a number in terms of unpacking priority, so you can use set-up and use your essential items as soon as possible. Instead of moving the whole piece at once, dismantle it so that can be transported and reassembled easily. Smaller components can be rearranged to take up less room and will require less people to carry. Secure all the small components that came off during the dismantling process, such a screws and bolts, in a clear plastic bag or container. Label the bag so you know where the hardware belongs, or stick it onto the furniture with tape. If you’ve run out of boxes, do not pack your items in your furniture – they are not designed to be moved and this could increase the risk of causing significant damage during transit. Prior to pulling out all the cables from your TV, take a photo of how things are connected, in order to ensure you can put it back in quickly and effortlessly. Furthermore; to prevent confusion about which cable belongs to which electronic good, sticky tape the cable to the item so that you won’t have to do any guesswork. If you have special plates that must be kept in pristine condition, you should wrap each in layers of clean white paper. Otherwise you can place plastic or Styrofoam in between them to prevent them from breaking. Use vacuum seal bags for out-of-season clothing and pack clothes in baskets, hampers and suitcases to save space. Wrap glasses and small breakables up in clothes. Store jewellery in boxes, otherwise you can roll up them up in a bath towel to prevent necklaces and bracelets from becoming tangled. Pack makeup in a hard cosmetics case, making sure liquids, creams, dry items and brushes are separated. Put self-tan products that can stain in a separate zip-lock bag. Use blankets to wrap around paintings and other pieces of art to keep them safe from damage during transit. Drain the garden hose and cover the blades of your lawn mower when packing to prevent damage being cause to your other goods during the move. We hope you’ll these tips handy when it’s time for you to move. If the job turns our bigger than expected, or you just need some advice; contact us to see if we can help. Ready2Go Australia Pty Ltd is an established removalist business administered by a professional and experienced team with years of local, commercial and interstate removals behind them.